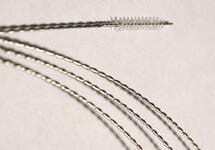 For over 45-years, Brushes Corp has designed and manufactured twisted-in wire brushes for the medical and dental industry for basic instrument cleaning and specific applications as follows. Brushes Corp. specializes in fine diameter wires to be used as cytology brushes and stylet wires. We develop and mass produce a variety of miniature brushes for custom medical applications. We offer a variety of shapes and materials including plastic coated wire. Our ultra-fine miniature brushes are often utilized in interdental applications. Our custom manufactured tube brushes are used throughout the medical industry for trachea tubes. We offer a variety of handle styles and brush shapes to fit the tube design.